23 Beautiful Wedding Gowns With Sleeves That Will Make You Say "Wow"
Get ready to say "YES!" to the dress. 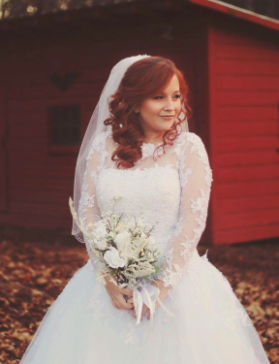 I recently got married, so I know how daunting it can be to shop for the wedding dress of your dreams. There's SO much pressure to find "the one," especially when you have a ~vision~ in mind already. The stress of choosing who to bring with you, where to shop, and how to know what you're looking for is enough to send any bride-to-be into a tizzy. Add the request that the dress have sleeves and you'll probably want to crawl into a ball and call the whole thing off. Deep breaths. I'm here to help. 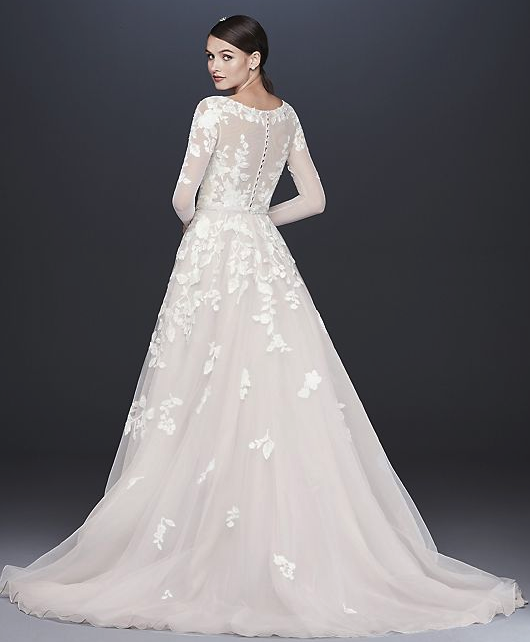 I've rounded up some stunning gowns with long sleeves you can get right here on the web! Consider it my engagement gift to you. 1. 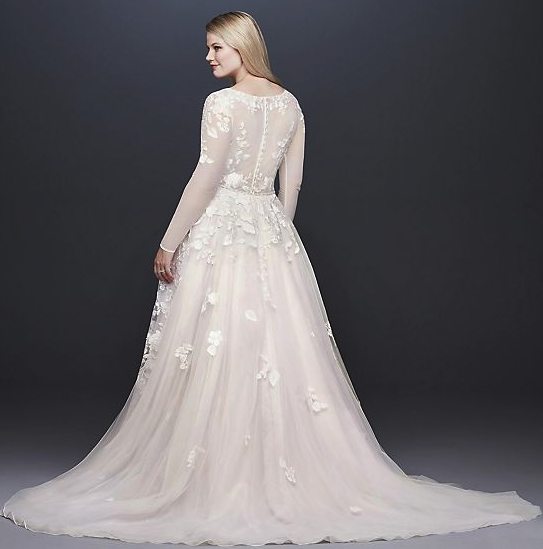 An elegant gown with a lace back, long sleeves, and a relaxed mermaid silhouette that will promptly bring your significant other to tears. 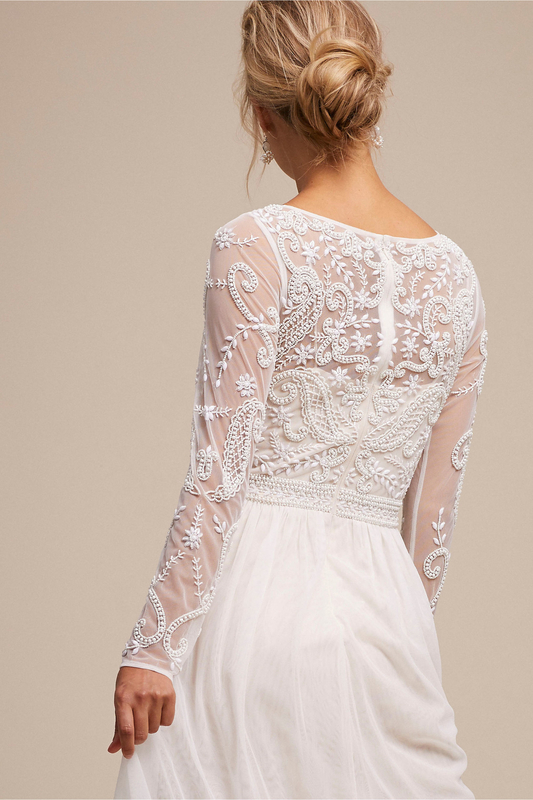 Get it from BHLDN for $1,075 (available in sizes 0-18). 2. A ball gown to make you feel as glamorous as a Disney Princess on your special day. Get it from Amazon for $115+ (available in sizes 2-26 and in white or ivory). 3. 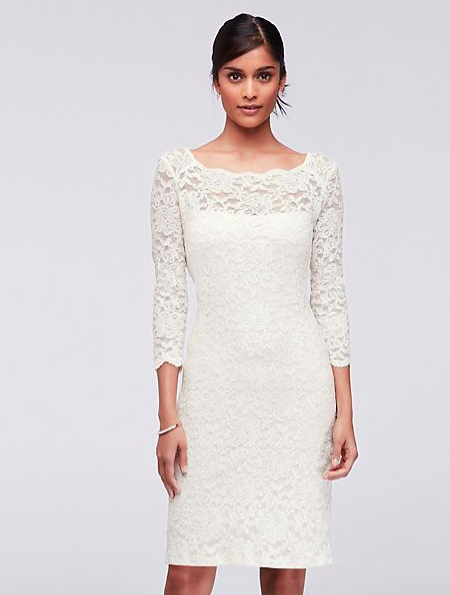 A lace A-line sheath dress that will assure you everything will be coming up roses on your wedding day. Can't you just picture walking down the aisle of your garden wedding in this rose-filled beauty? Get it from Nordstrom for $998 (available in sizes 00-16). 4. A gilded three-quarter-sleeve dress, so you can feel like a bride but also dance the night away without any fabric standing in your way. Get it from ModCloth for $175 (available in sizes 2-26 and in four colors). 5. A modern three-quarter-sleeve gown that rivals Meghan Markle's royal version. 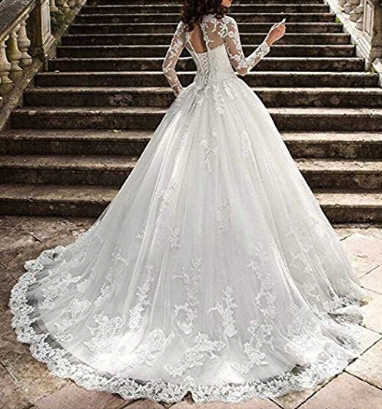 This dress looks just like one the Duchess of Sussex wore the day she became Prince Harry's wife, don't you think? All you need now is a stunning tiara and a handsome prince (or princess) to complete the look! 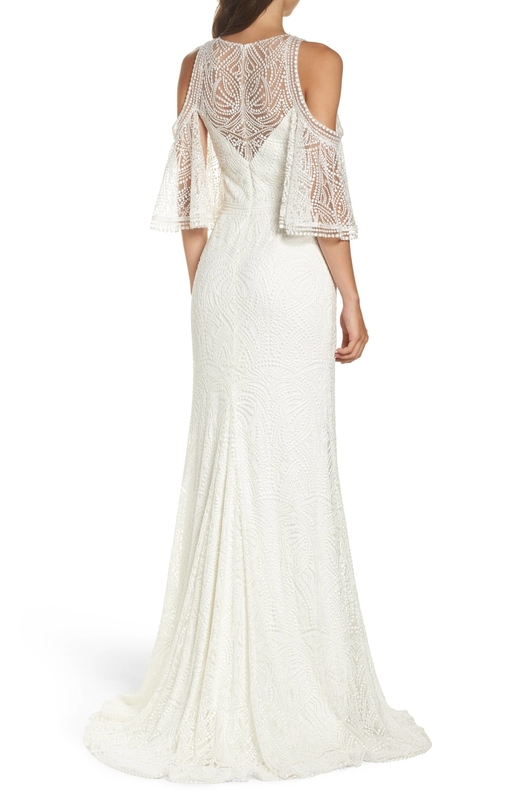 Get it from BHLDN for $900 (available in sizes 0-18). 6. 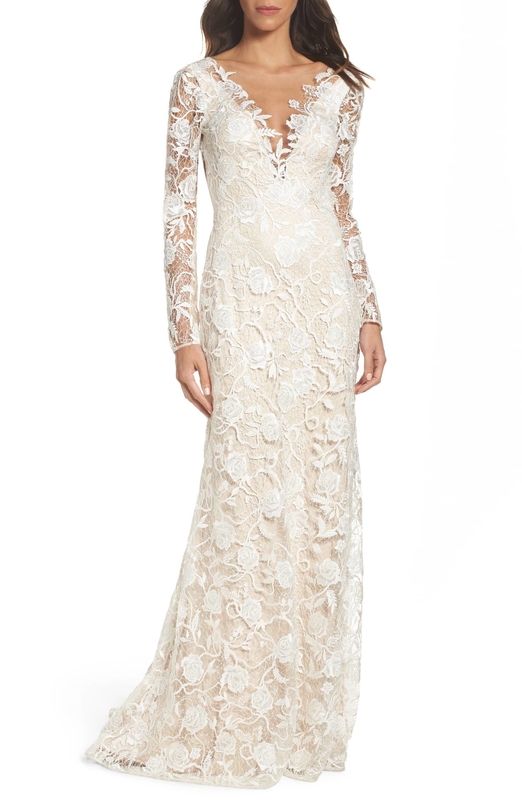 A beautiful bridal maxi dress with lace sleeves, so you'll look more elegant than ever as you strut down the aisle. 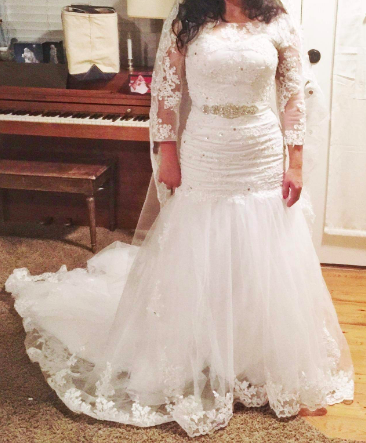 Promising review: "I purchased this as my wedding dress. It fits well and the material and construction are both excellent quality for the price. I am small-chested and ordered a small and there is some extra room in the bust. I honestly don't think I'll have it altered or cups put in; I think it will be solved with a backless push-up. Happy with this purchase, and encourage others to try it!" —Clair K.
Get it from Lulus for $86 (available in sizes XS-S with more sizes restocking shortly, and in seven colors). 7. A stunning gown with intricate lace sleeves and a train that will make your guests' jaws drop upon your entrance. Get it from Amazon for $159.90 (available in sizes 2-16 and in 18 styles). 8. 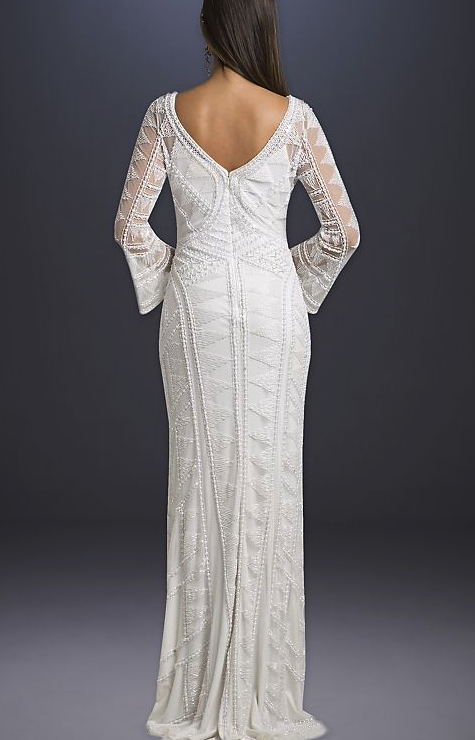 A beaded long-sleeve sheath dress for the fashion-forward bride who really wants to wear something unique on her big day. Get it from David's Bridal for $598 (available in sizes 6-16). 9. 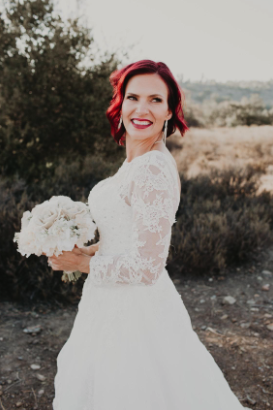 A wedding dress with a plunging neckline and a trendy cutout in the back that will make your grandma blush — but she can't complain because IT HAS SLEEVES! Get it from Nordstrom for $1,200 (available in sizes 6-18). 10. A champagne tulle dress, because every bride should have the chance to wear a dress that looks as if it were dreamt up by an actual fairy. 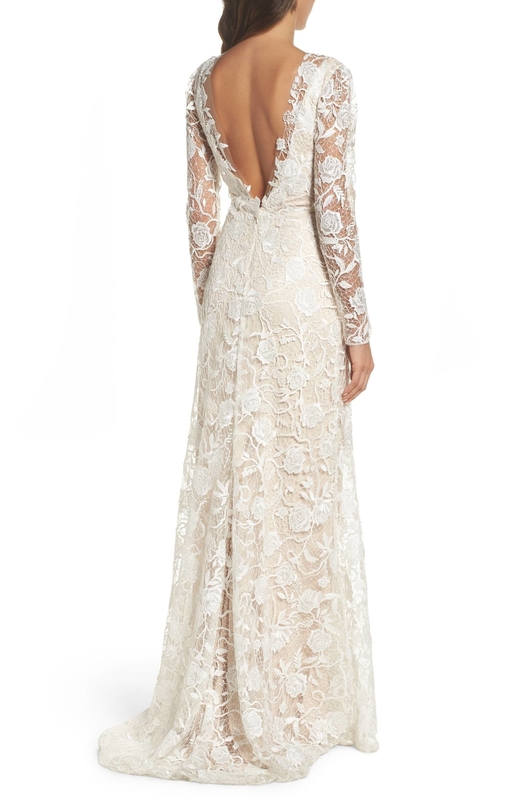 Get it from BHLDN for $1,250 (available in sizes 0-10). 11. A plunging ball gown that features a leafy overlay you are sure to ~fall~ in love with. Get it from David's Bridal for $1,158 (available in sizes 0-14). 12. A fluttery bohemian gown for the flower child who wants to seamlessly float down the aisle without sacrificing her own personal style. Get it from BHLDN for $800 (available in sizes 2-16). 13. A bridal gown that only looks expensive — gazing at the detailed beading throughout you'd never know it cost under $100 (!!!). 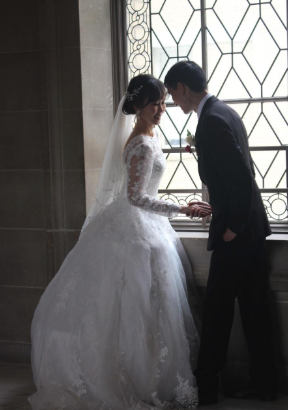 Promising review: "This dress was absolutely perfect. 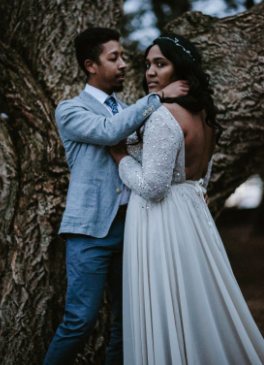 I wore it for my NYE beach wedding and it was the perfect amount of light and cozy. No need for a bra, which was wonderful. I am short (only 5’2") so my friend and I did shorten the front a bit, but the rest of the dress was very true to the measurements listed. I have gotten so many compliments on this and people are always astounded that it was less than $100 on Amazon." —Cassandra B. Get it from Amazon for $69+ (available in sizes 2-22). 14. 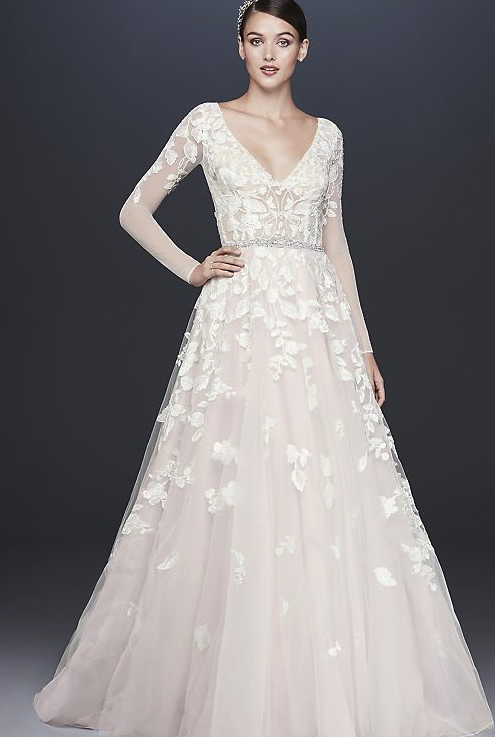 A romantic dress with cap sleeves, a swirling vine embroidery, and delicate pearl-inspired beading for a demure bride who still wants to show a touch of skin. Get it from ModCloth for $90.97 (available in sizes XS-2X). 15. A high-neck gown that will make any bride look like she just stepped out of a fantasy land and into her wedding ceremony. Promising review: "I am absolutely in love with this dress! 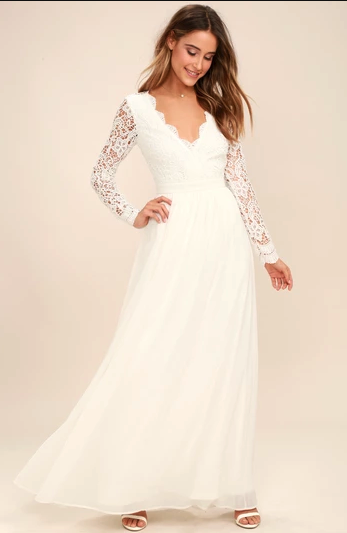 I had purchased it a month before my wedding and wanted something flowy, comfortable, elegant, and a little bit bohemian. I had looked EVERYWHERE for a dress and simply couldn't find one that was comfortable, in my budget, while also being strikingly beautiful. Once I put this dress on, I had that special feeling you hear about. I just couldn't stop smiling because I felt like ME in it! It had all the qualities I wanted. It seriously feels like you're wearing a nightgown, it's so comfortable, and the fact that it is under $100 is just incredible. I received SO many compliments on this dress, and everyone was dumbfounded when I told them I had simply ordered it online. That easy. You won't be disappointed—buy it!" —Gretchen A. Get it from Lulus for $82 (available in sizes XS-XL). 16. A beaded beauty of a dress, perfect for a casual dinner reception or a classy affair. Get it from BHLDN for $350 (available in sizes 0-18). 17. A dazzling cold-shoulder wedding gown that will keep the couple so distracted they won't even think about getting cold feet. Get it from Nordstrom for $798 (available in sizes 00-16). 18. 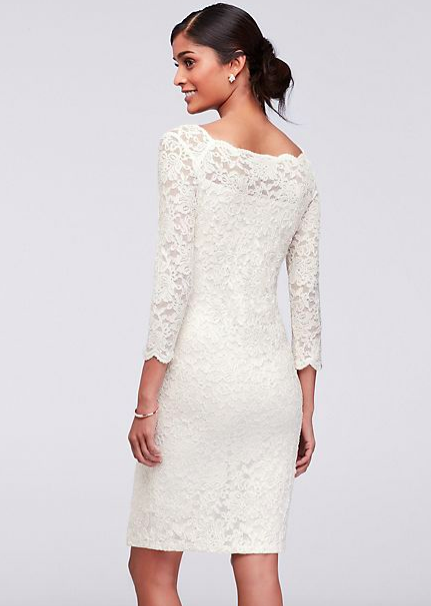 A short lace wedding dress, for the casual bride who wants to show a little leg. Ooh la la! Get it from David's Bridal for $498 (available in sizes 2-16). 19. An embroidered gown that would make for a flawless beach wedding look. Yes, you can even wear sleeves in the sand! get it from BHLDN for $275 (available in sizes 0-16). 20. A stunning dress with illusion sleeves to make you look and feel like royalty as you walk down the aisle. 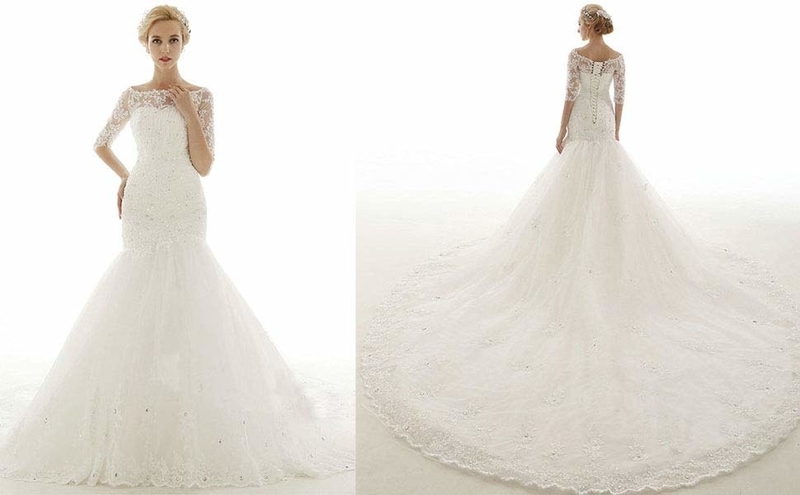 Get it from David's Bridal for $1,258 (available in sizes 16W-26W). 21. A separate top and skirt that will let you completely customize your wedding day ~look~ to match the one you've been cooking up in your brain forever. Before I settled on my wedding dress, I was highly considering making my own look by combining a separate top and skirt from BHLDN. If you're not finding what you want in a single gown, try your own combos! 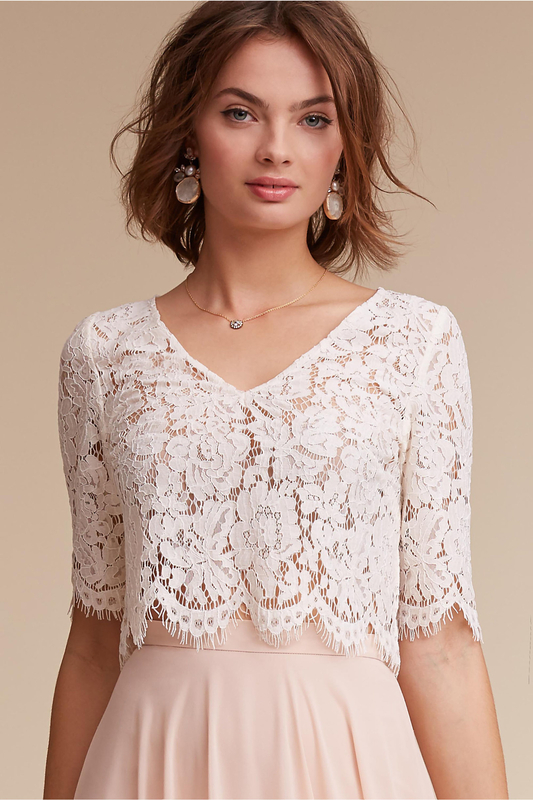 This lace top combined with a satin bottom is e v e r y t h i n g.
Get the top for $100 (available in sizes XS-XL) and the skirt for $700 (available in sizes 0-14) from BHLDN. 22. 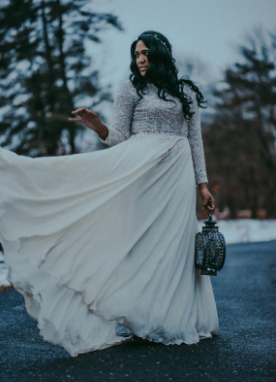 An affordable jeweled ball gown, because every winter bride should be able to be comfortable, warm, and dazzling on her special day. Get it from Amazon for $100+ (available in sizes 2-26 and in white or ivory). 23. And a chic V-neck gown that will make you look like a goddess who just descended from an actual freakin' cloud. Seriously, this gown is what modern wedding dreams are made of. Get it from Nordstrom for $1,200 (available in sizes 2, 6, 8 and 10).